It’s my personal opinion that the Game Gear’s screen has not aged well. Unlike the Game Boy systems, there was only one revision of the Game Gear made by Majesco, which didn’t offer much improvement. Some people have modded the GG’s backlight with a newer one which saved battery life, but it didn’t improve the overall picture enough to make a drastic difference. Other people had even installed newer LCD screens into their Game Gear’s, but you’d either be forced to play them in half-screen, or stretched. Luckily, McWill, creator of the excellent Atari Lynx mods has also created a kit for the Game Gear, marking the first time someone’s truly been able to improve the Game Gear’s portable experience. His LCD kit offers scaling effects and scanlines without creating any lag, all while having the pixels stay in their right positions. This is because the pixels are captured digitally into ram, instead of being an analog conversion. 1 – Scaled Resolution: The Game Gear’s 160×144 resolution, stretched to the 320×240 resolution of the internal LCD screen. 2 – Scaled Resolution with Scanlines: This mode ads vertical scanlines, emulating the look of the original screen. It’s very hard to capture in pictures, but in person I really enjoyed the effect it created. 3 – Doubled Horizontal Resolution, Scaled Vertical resolution: This mode doubles the GG’s 160 horizontal pixels to 320, so when stretched to the 320 pixels of the LCD screen, the horizontal resolution eds up scaled perfectly, while the vertical resolution is stretched. 4 – Doubled Horizontal Resolution, Scaled Vertical resolution with Scanlines: This is the same mode as above, with scanlines added. 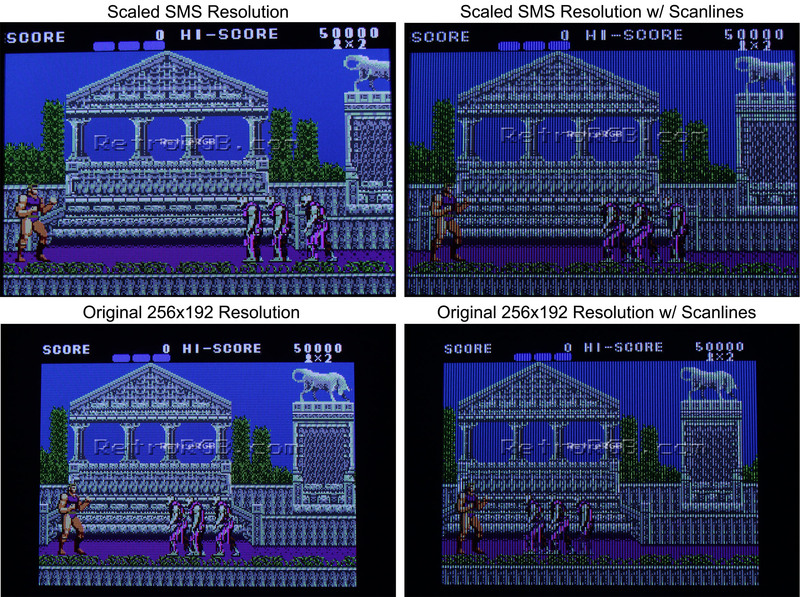 5 – Doubled GG Resolution (upper and lower parts are cut off): The Game Gear’s resolution is doubled to 320×288, but only 240 of the 288 vertical pixels are displayed. This allows for no stretching, but with the top and bottom of the image cut off. In some games this doesn’t really make any difference at all. 6 – Doubled GG Resolution with Scanlines: This is the same mode as above, with scanlines added. 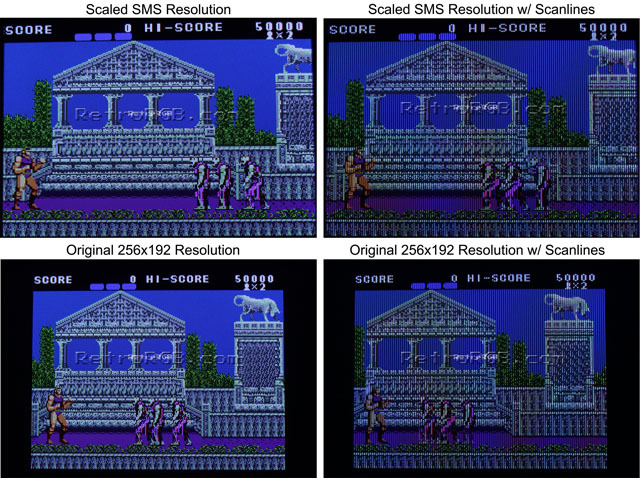 7 – Native Resolution: This final mode displays the native 160×144 resolution, centered in the 320×240 resolution of the screen. In a perfect world, we’d be able to find modern LCD’s that match the exact size, resolution, refresh rate and aspect ratio of the original handhelds. 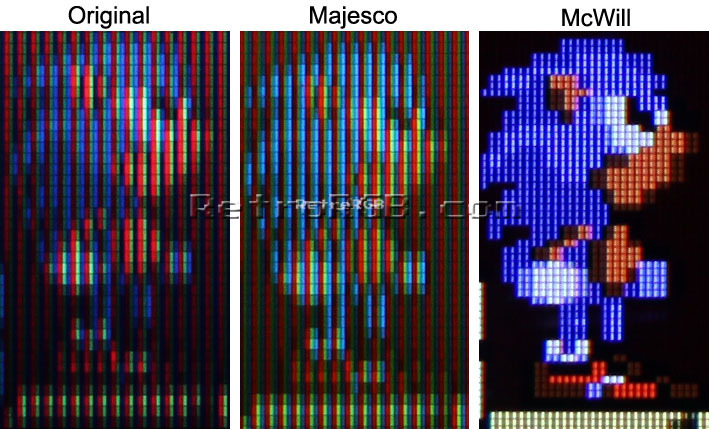 Since that’s impossible to find, McWill has done the next best thing by digitally scaling the original Game Gear video signal onto a newer, high-quality screen. While it doesn’t exactly match the look of the original Game Gear, I find the second mode “Scaled Resolution with Scanlines” to be great for most games. Some games such as Fantasy Star have weird vertical effects in that mode, so for those games I just switched to doubled mode and it looked fine. As a kid, I owned a Game Gear and while I really loved it, I was always annoyed and distracted by the terrible look of the screen; Even back then I felt it took away from the gameplay. I can honestly say that playing Mega Man on my Game Gear with McWill’s LCD screen absolutely blew me away and it was like experiencing the Game Gear again for the first time. Unfortunately, the kit is extremely expensive, but truly worth it for any serious Game Gear fan. I suggest checking out the Game Gear TV-Out page for details on McWill’s VGA / RGB out mod, otherwise please head back to the main Game Gear page for more information.